A method for being able to part the sea! During an evening ceremony around a campfire at the beach, the sea parts allowing safe passage to an island off shore. This is elemental manipulation and not an AAA effect!!! 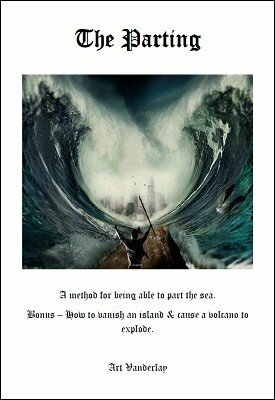 Bonus effects - Cause a volcano to explode and an island to vanish! Well, I feel I had to write this, to make my feelings public. I feel myself betrayed. Even conned. I knew that elemental magic was somehow controversial but I am well into bizzarrism so I have no fear of controversial material. I'm also very open to original methods and applications. Sometimes the effect is subpar. Sometimes is so dumb that you feel ashamed when performed. This ebook is way more than this. I could bear the secret behind the water parting. Yes, it's exactly as described and can be performed only on a bunch of locations in the world. I bet you will never perform this. I'm ok with that but I lost my nerve with the description of the flamethrower. A PLASTIC flamethrower!!! I can't request a refund because the ebook is ok, it's just I strongly dislike, even despise, the content. But I can warn you with this review. Please, do your research very well before purchasing this ebook. It's not cheap and you will feel like me.